Being an Eisner fan, especially of the Spirit, I searched for this particular one-shot published by Eclipse for years, finally running across a copy of it a few weeks back at a local flea market for 50 cents. Basically rehashed Spirit stories....and that, my friends, in the hands of Eisner is not a bad thing at all. 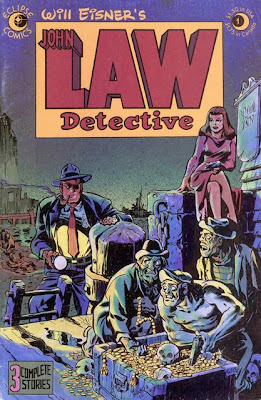 Eclipse Comics’ 1983 one-shot John Law, Detective treats readers to three action-packed adventure mysteries produced in 1948 by comics master Will Eisner. Perhaps the John Law stories were considered too close to Eisner’s more famous detective creation, The Spirit, to see publication in their own day. 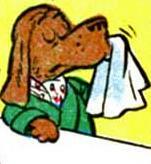 Indeed, Eisner eventually reused the John Law material in several classic Spirit stories, including the famous “Half-Dead Mr. Lox.” For whatever reason, the publisher went as far as to shoot stats for John Law then let the project languish at the bottom of a file cabinet until it was unearthed nearly 35 years later by intrepid Eisner devotee Cat Yronwode. The result is like finding a complete unreleased Beatles album from 1966 or a lost Orson Welles film—a rare look at a masterwork from a creator at the absolute peak of his powers.